Wow! I really enjoyed my time while reading this story. Marks takes the readers on a crazy adventure filled with mythology and fantasy. Just when you think you have everything figured out, she rips the rug out from right under you. I loved that the author mixed modern-day with a lot of heavy mythology. You have all these houses vying for the young blood. With Sage on their side, she would tip the scales of power and make one house more powerful than the others. There were shades (vampires), wraiths, demigods with varying powers, pixies, and druids. I really appreciated the fact that the author didn’t info dump on us in the beginning. Instead, we learn as we go, just like Sage does. Speaking of Sage, I really liked her character. Sage is not a pushover. She may be completely out of her element with everything going on, but she never fully submits to what’s going on around her. She doesn’t trust easily, and she isn’t afraid to voice her opinion. I loved that she didn’t accept everything at face value and wasn’t afraid to put her foot down in order to get answers. We also get the POV of her mentor and protector, Faelan. He was a surly character at first given the fact that his job was only to find Sage and bring her in, not be her babysitter and teacher. However, the more time he spends with her, you can see him start to lighten up and let her in. At first you have no clue what he is, other than the fact that he’s super powerful. I mean, he’s able to withstand her flame, his suite is a legit forest, and he heals and feeds by pulling life from plants. He was definitely an interesting character and I really appreciated that the author chose to give him a voice. While a lot of the story is of Sage figuring out how to handle her power, learning about the new world she’s now a part of, dodging attacks from one of the houses, and having to figure out what house to align herself with. There wasn’t really a dull moment to this story. There was always something going on. I will be honest and say that I’m not quite sure about the potential love triangle… or hexagon if you will, that looks like it may take place. A lot of the side parts of the story now make more sense, and you build a connection between these characters because of it, but I’m just not on board with it. Although, nothing is definite yet, so I suppose I will just have to wait and see what the author has in store next for Sage. I was completely wrapped up in the story right from the moment we meet Sage on the streets. I had a hard time putting it down as she was kidnapped, told she’s a demigoddess, and started setting things on fire by accident. I enjoyed reading about all the mythology the author incorporated into the story. 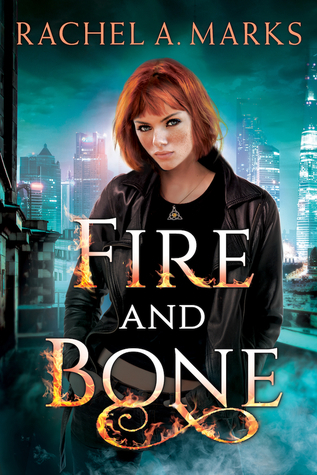 I think for anyone looking for a clean new adult urban fantasy (I know this is being classified as YA but Sage is 18 years old), then you should really pick up this book. Oh that sounds really good. Sage wounds like a great character. That is awesome no info dump like many 1st book have and was able have it flow throughout. Sounds like a good read with some twist and turns. It was a really good read. I am looking forward to the next book in the series. I will be honest that Love Triangles aren’t what I like but there are so many elements in this story that are so intriguing. I do love a story that you can get wrapped up in. They aren’t mine either. I get turned off by them rather quickly. However, this is brought up so subtly that I’m really curious how the author will handle it. Sage sounds like an awesome character. And I’m glad the book was enjoyable all the way through, and no big info dumps! Always good for the first book in a series. It was a really enjoyable read. I can’t wait to get my hands on the sequel. I would be curious about this one and it’s great to hear it’s a good one! I didn’t even know about it. It was a fun read. I really liked all the characters in the story and how much mythology is worked into the story. It was a great read. I felt like it was more of a new adult book since Sage is 18 and her life doesn’t consist of high school or anything you would typically associate with a young adult novel. Oooh, this sounds fantastic. I like the idea of the modern day mixed with the fantasy and am especially intrigued by the idea that Sage is Celtic demigoddess. Both Sage and Faelan sound like characters I would enjoy getting to know. Great review! Yeah. There’s a thing with her mentor, and then another guy pops up talking about prophecy and how they are meant to be together… and then there’s more craziness with prophecies and… yeah. I don’t want to give anything away in case you read it because it was a big plot twist. LoL It wasn’t like she was falling in love with a bunch of guys. It’s just complicated and I could see all these options popping up as a love interest, and how that would completely alter the story going forward. Oh wow! That’s huge. House hunting is no joke. I would be on a book buying ban, too, if I were in your shoes. You wouldn’t think it, but books add up and they can be pretty expensive. I hope you give this book a shot. It was really good and the love hexagon is very complicated and isn’t necessarily what you would think. LoL That’s all I’m going to say because I don’t want to give anything away for you.